On the 12th March 2016 the Italian team organized the Superfoods Day. The Italian team prepared a big buffet including the project foods from A to Z . All the guys prepared a dish at home: a bergamot cake, the Turkish Kisir, the Chocolate cake suggested by the French team,some orange and grapes juices, a Kiwi cake, the orange salad, an orange cake, the bruschette, the pasta, the Czech poppy seeds cake, a Quinoa salad, a tomatoes salad, the grilled zucchini dressed with vinegar and we offered some apples, boiled eggs,dried figs, honey, icerberg salad, nuts, walnuts, honey, Greek yoghurt, xigua . The most important dish was cooked by our Chef Mr Daniele Pensabene, who honoured us with his presence again and cooked a saffron Rice with Citrus fruits and shrimps. The students of the other third classes were also invited in order to disseminate our project and live the experience of the eTwinning community. 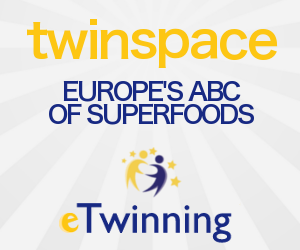 In fact, the Italian etwinners showed them some posters they had made about the "essence" of the Europe ABC's Superfood project as well as some pages and works on the twinspace to let them know how an etwinning project works. Mrs Simona Sapone, the headmistress took part in our "Super day" and she expressed her satisfaction with the project and she was proud of the students, the activities and the teachers, too. In addition, there was a journalist, Mrs Anna Biasi, present , who interviewed the teacher and she is going to publish an article on an e-magazine !! The Buffet has been a Wow not only for the guys but for the other teachers, too ! Thank you guys for having worked so hard! Thanks to eTwinning the Italian students had an opportunity to be gratified.